The Network for Children’s Rights organizes a campaign for the Children’s Rights, with the help of more than 50 organizations, museums and cultural operations, and among them, there is our colorful “saita” (paper plane). Under the motto “Defending my rights, reclaiming my childhood” several events have been planned to take place from November 19 till December 10. In the context of these events, Saita Publications, in collaboration with the Office of School Activities of the Directory of Primary Education in Kavala and the Department of School Activities- cultural issues of the Directory of Secondary Education in Kavala, is organizing the events. 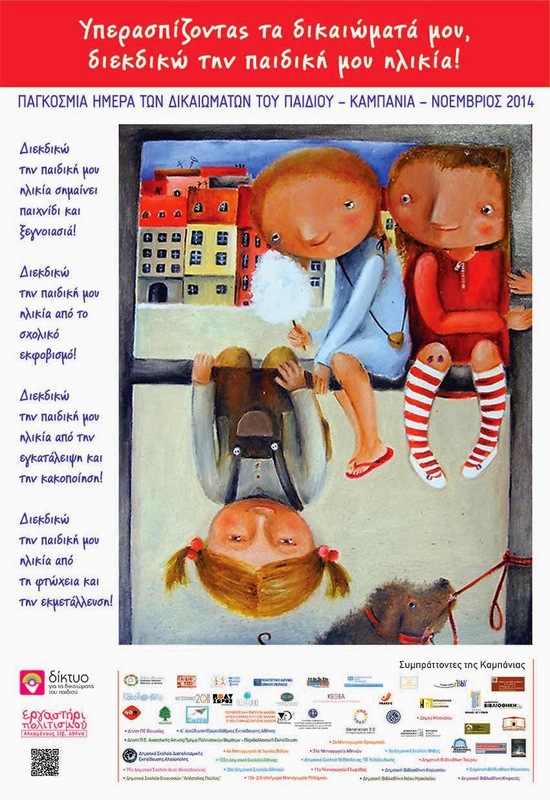 The 1st part: The painting and history competition(in the form of a short story) for the 4th, 5th and 6th grade students of the Elementary Schools of the Regional Unit in Kavala. The 15 best paintings and the 15 best stories will be awarded in an open event. We would like to thank the Network for Children’s Rights for giving us the opportunity to be part of this particular campaign, and we would also like to thank Mr. Panayiotis Papazoglou, Educator and Head of the Department of Activities-cultural issues of the Directory of Secondary Education in Kavala.